Interlocking plastic water filled barrier, ideal for road maintenance, civil and construction projects. Made from polyethylene, the ArmorZone Plastic Water Filled Barrier is made up of 2m long plastic units joined using a twin pin, and then filled with 520 litres of water. The Fortress Fencing ArmorZone water filled barrier is a high performance plastic unit. It is ideal for creating a protective barrier around work sites. The ArmorZone is recommended for use on temporary construction sites and also to protect workers engaging in roadside maintenance. This water filled temporary barrier is easy to transport and fast to deploy. Installation by two operators is effortless. Once filled, it creates a durable barricade. The ArmorZone barrier is the preferred choice within the industry as it is tough and durable, fast to install and competitively priced. During deployment, the ArmorZone barriers are linked using a unique ‘twin pin’ connecting rod. Once connected the barriers can be filled with up to 520 litres of water. However, when empty, they are very easy to manoeuvre, weighing just 41kg. Plus, the freight-friendly design helps to reduce shipping costs. The Fortress Fencing ArmorZone water filled barrier can be installed in a straight line, or in a configuration with a small amount of curvature. 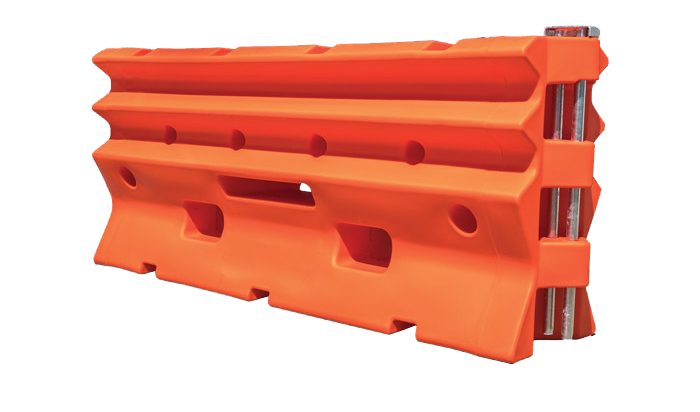 It provides up to 70kph work zone barrier protection. Additionally, the ArmorZone is tested and proven to assist with vehicle control, offering low deflection.